In this novel rich in character, Junior Thibodeau grows up in rural Maine in a time of Atari, baseball cards, pop Catholicism, and cocaine. He also knows something no one else knows-neither his exalted parents, nor his baseball-savant brother, nor the love of his life (she doesn't believe him anyway): The world will end when he is thirty-six. While Junior searches for meaning in a doomed world, his loved ones tell an all-American family saga of fathers and sons, blinding romance, lost love, and reconciliation-culminating in one final triumph that reconfigures the universe. A tour de force of storytelling, Everything Matters! is a genre-bending potpourri of alternative history, sci-fi, and the great American tale in the tradition of John Irving and Margaret Atwood. 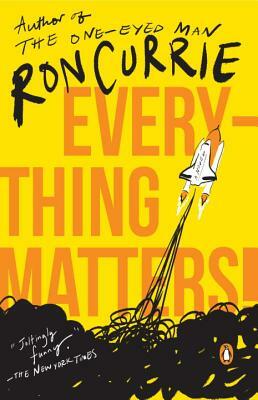 Ron Currie is the author of the novels Everything Matters!, Flimsy Little Plastic Miracles, and The One-Eyed Man, and the story collection God Is Dead, which was the winner of the New York Public Library’s Young Lions Award. Currie received the Addison M. Metcalf Award from the American Academy of Arts and Letters. His books have been translated into fifteen languages. He lives in Portland, Maine. "Mr. Currie is a startlingly talented writer whose book will pay no heed to ordinary narrative conventions.... He survives the inevitable, apt comparisons to Kurt Vonnegut and writes in a tenderly mordant voice of his own.... Throughout the story there is the sheer delight of Mr. Currie's fresh, joltingly funny imagery.... Above all "Everything Matters!" radiates writerly confidence. The excitement that drives the reader from page to page is not about the characters. It's about seeing what Mr. Currie will try next." "Currie's novel is extraordinary, a lively narrative that slaloms from the exhilerating to the numinous to the achingly sad, all tied together by the author's sharp, funny voice." "Superb. . . Some scenes make you laugh out loud. There are passages of beauty and wicked turns of phrase. . . marvelously, Currie suffuses his unhappy and disparate characters with salvation." "A hyperbolic adventure story that's got the international intrigue of a Le Carré thriller and the deep humor of David Foster Wallace's Infinite Jest." "Everything Matters! contains both a declaration of the possibilities of narrative fiction and, above all, a defense of good old-fashioned human resilience in the face of petty distraction and profound horror." "There's something refreshingly youthful about Currie's eagerness to call out big existential questions that most of us have grown too embarrassed or cynical to ask. . . there's nothing predictable about this story, despite its firm ending date, and Currie repeatedly upends our expectations. . . He's writing for the Slaughterhouse-Five kids (you know who you are), people who respond to that quirky mix of dark humor, moral imperative and science fiction."